The printable view of my resume. You have begun the tedious job search process. You are trying to spice up your resume or CV. The problem is, your past job experience is quite varied, as are the jobs you are applying for. What might be a great resume for one job will be highly out of place for another job. So what do you do now? You can do what most people do, just copy your resume and tweak it until it works for the different job. You keep on doing this until you have so many different resumes that it starts getting difficult to keep track of. You can read below, to see the process of what I did to create this spreadsheet. You can also download my template here. If you are not logged into your Google (Gmail) account, you will only be able to view it. 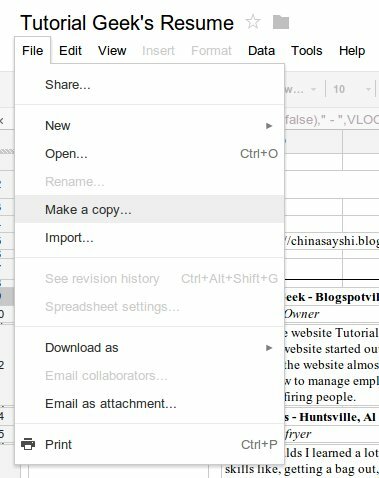 If you ARE logged in, you will be able to make your own copy and can edit it and save it in your Google Drive account (see below). Note* The tutorial below is not going to be super specific. It basically goes over the principles of how I created the spreadsheet. If you actually want to do it for yourself, your best bet is to just download the template and play around with it. In each sheet, I designate the first column as a key. This will allow us to do a lookup of the information you wish to change. I simply just added numbers as my keys, but you could input whatever you want. It might make more sense to use a word or letter that describes whatever it is you would like to reference. I also created a sheet of just categories. Doing this allows me to change up the order of my resume if I need to. 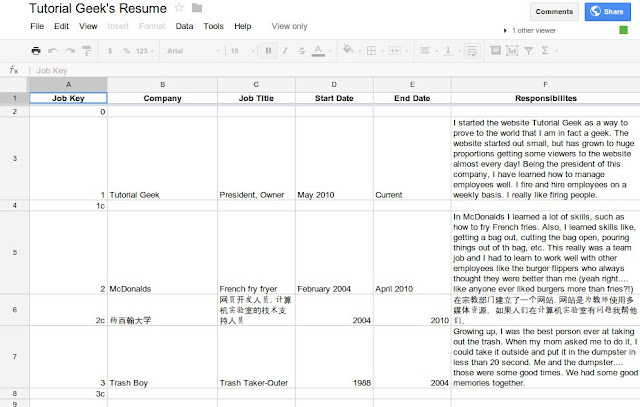 Also, it allows me to do a resume in a different language. You can see (below) that my number 1 key is for "Work Experience" 1c (c for Chinese) is the same but in Chinese. 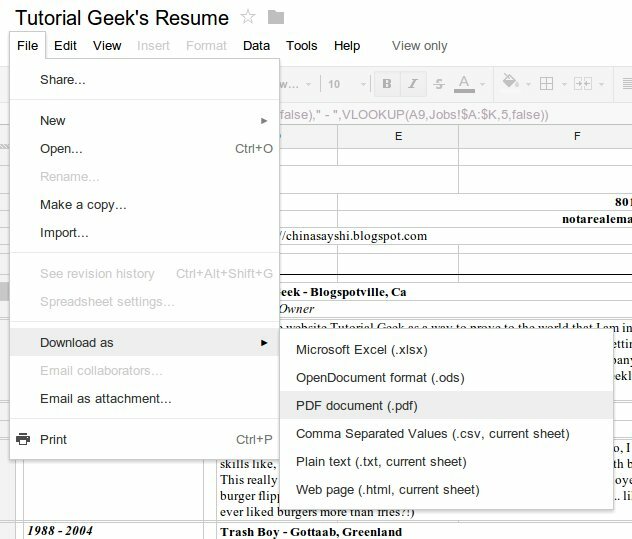 This makes creating a resume in a second or third language easy. Create a sheet for anything you think you would like to add to your resume. You can always add more later. 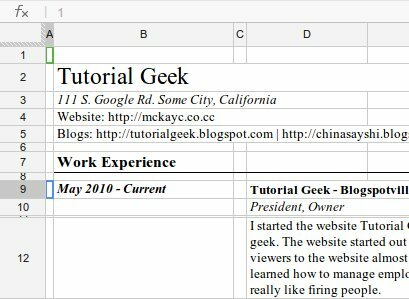 For this to work dynamically, you will need one sheet to be the actual template for the resume. This is what you will download or print. You can format it however you would like (depending on your spreadsheet skills of course). 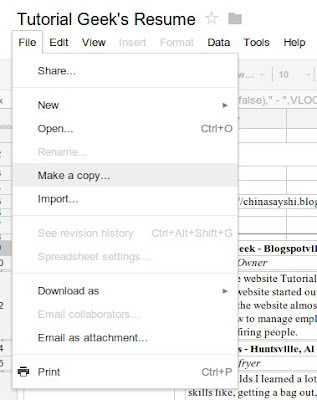 The important thing now though is calling the data from your other sheets. Please look at the screenshot below; you will notice that A9 has the number "1" in it. It does not actually appear in the column though because I have changed the color of the column to white. This is our key however and is important to call the data from our other sheets. Changing this number will change the information (in this case, work experience). Number 1 will show the first job I have listed in my work experience sheet. Number 2 will show the second, and so on. Here is the tricky part, in the cell just to the right of the key (the number 1), we will do a vLookup. In this particular instance, it goes to my Work Experience sheet, then looks up the first date and concatenates it with the second date. I do the same thing in all the other cells pertaining to that job. They all reference A9, because that cell has the key. 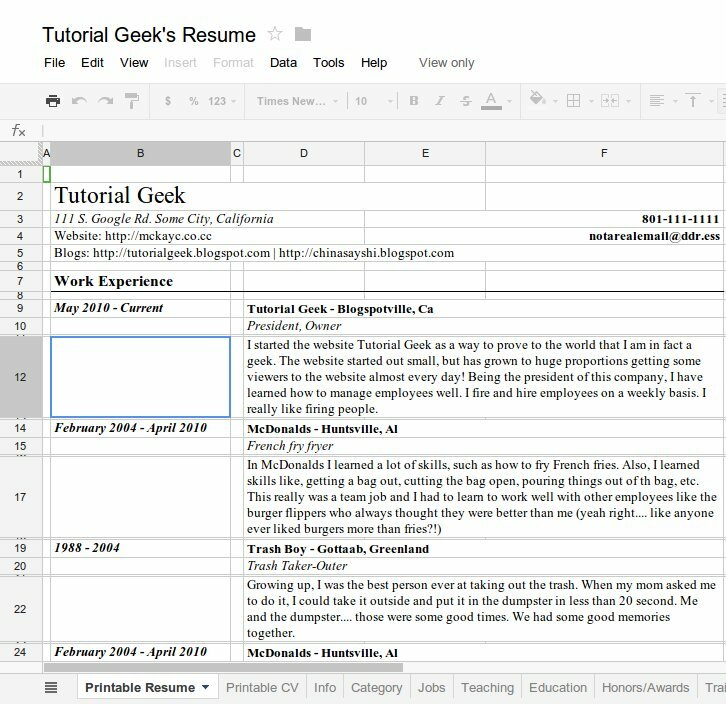 Having a resume that is a spreadsheet is basically worthless as is, but if you print it out, or download to PDF and email it, no one will know that it was ever a spreadsheet. When exporting, only select the option for "no gridlines." 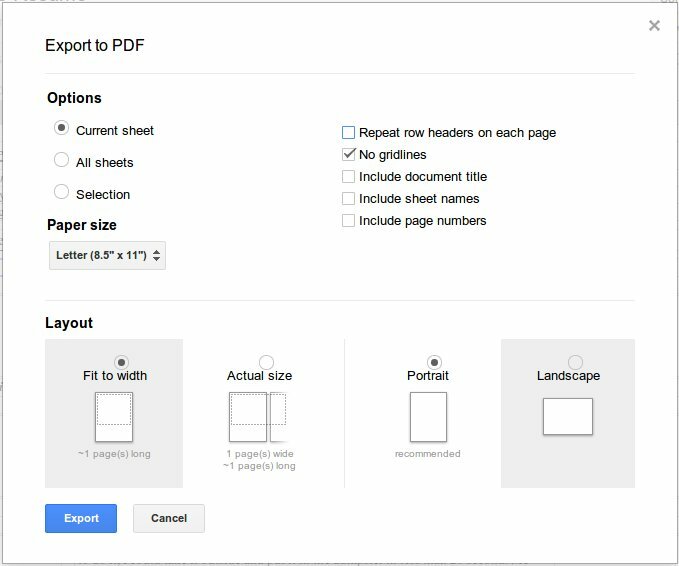 Select the paper setting as appropriate for your printer setup. 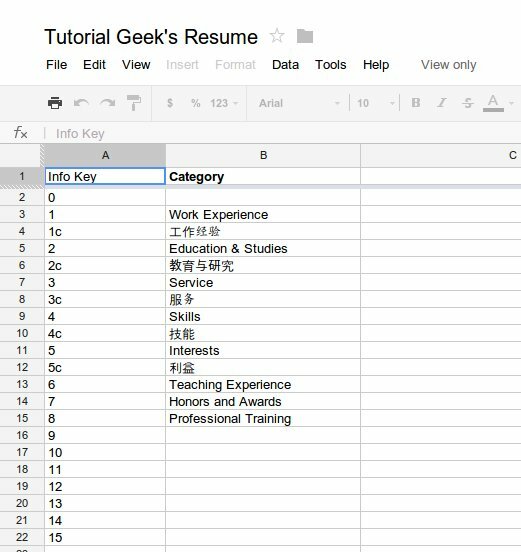 Once you have exported it, you now have a presentable resume! If you want to change it, just change the keys to suit your needs and export it again. 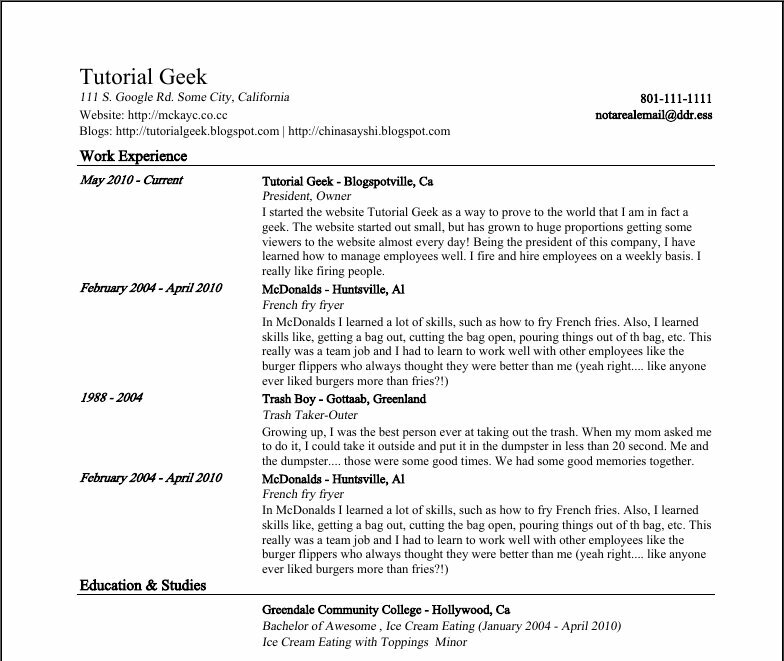 If you find the resume template useful, feel free to write a comment below to let me know! I don't know if I agree about you being the best trash-taker-outer in the world, but you can remember things however you want if it helps you sleep at night.